Switching the camera mode dial from auto to any non-auto mode is a nice start, but to truly be a proficient photographer who must truly understand the exposure triangle, is tough. The exposure triangle is simply the relationship between your ISO, shutter speed and aperture. These three components work together to create an actual exposure or photograph. It is referred to as the exposure triangle because when you adjust one element, another element MUST change to capture the same exposure. When learning the photography basics and understanding the exposure triangle it is paramount to always remember this cause and effect relationship. Before we get into the details and specific technical examples about understanding the exposure triangle, let’s first make sure we understand each of the elements – ISO, shutter speed and aperture. ISO or ASA is a term from the film photography days which referred to film sensitivity to light. The lower the film sensitivity or ISO the less “grainy” the photo will be. The same concept is true today with digital photography, as ISO now refers to the sensitivity of the camera sensor. Just remember, the lower the ISO number, the cleaner looking your photo will be. This means there will be less “grain/noise.” However, keep in mind that sometimes photographers use high grain/noise as an artistic effect. For a far more detailed discussion on ISO, check out this post: ISO Explained the Easy Way! Tired of Grainy Photos? – You’ll love my brand new Crisp & Clean Presets Collection! Shutter speed is simply the amount of time (measured in seconds) that the camera’s shutter is open allowing light to hit the sensor to make an exposure. The higher the number, the fast the shutter will open and close. Aperture refers to how large or small the opening is thru the lens, as you can see in the above illustration. This opening is what controls how much or little light can pass through the lens and onto the camera’s sensor. Each lens has its own aperture range. This means one lens can open as wide as f/1.4, while others start at f/4.0. Aperture is measured in “f-stops” and a lower f-stop number such as 1.8 means a wider aperture (lets in more light), a high “f-stop” number like f22, means a narrower aperture, letting in much less light. The easiest way to think of how all three work together to give an exposure is to keep one of the three components constant. Let’s make ISO the constant (so don’t worry about that changing). The next step is to choose your f-stop or aperture. Remember that both aperture and shutter speed both control how much light is coming in thru the lens (aperture) and onto the camera’s sensor (shutter speed). Therefore, if using a wider aperture (lower f-stop number) you are letting in more light and therefore your shutter speed should be faster compared to when using a narrower aperture (higher f-stop number) for the same given exposure. Based on the light outdoors, you set your ISO at 200. If you’re taking a photo and you’re using aperture priority mode, you set the camera lens to f/4, and the camera selects 1/250th as the appropriate shutter speed. If you decide to change the aperture to f/2.8 you are now letting in more light into the camera requiring an adjustment on shutter speed (faster) to let in the same amount of light between aperture and shutter speed. Since you are keeping ISO constant, the new shutter speed with an aperture at f/2.8 from f/4 would be around 1/500th of a second. Changing the aperture from f/4 to f/2.8 is letting in twice as much light, so in order to compensate for that extra light, the camera is choosing a twice as fast shutter speed – 1/250th to 1/500th. Don’t worry though, in aperture priority mode, you just change the aperture and the camera’s light meter will determine the correct shutter speed. To see why I love shooting in aperture priority mode over manual sometimes check out this read. Shutter Speed – How LONG of a time the shutter remains open, to allow light in. Always use the lowest ISO as possible! That way, you can try to achieve the cleanest (less grainy) images with the best dynamic range and color depth. Outdoor, this will range from ISO 100-400, Indoors ~ISO400-3200, Dark Receptions ISO 1600+. Please note that these values will vary slightly depending on the ambient light in the situation. For faster shutter speeds (to capture movement), use wider apertures and/or higher ISO. To prevent motion blur and get sharp photos, shutter speed should be at minimum 1 / (double your lens focal length) for full frame sensor cameras and 1/(1.5 x focal length) for crop sensor cameras. Note: rule above is rule of thumb for stationary subjects, moving subjects may require faster shutter speeds. If you are a visual learner make sure to check out this video! 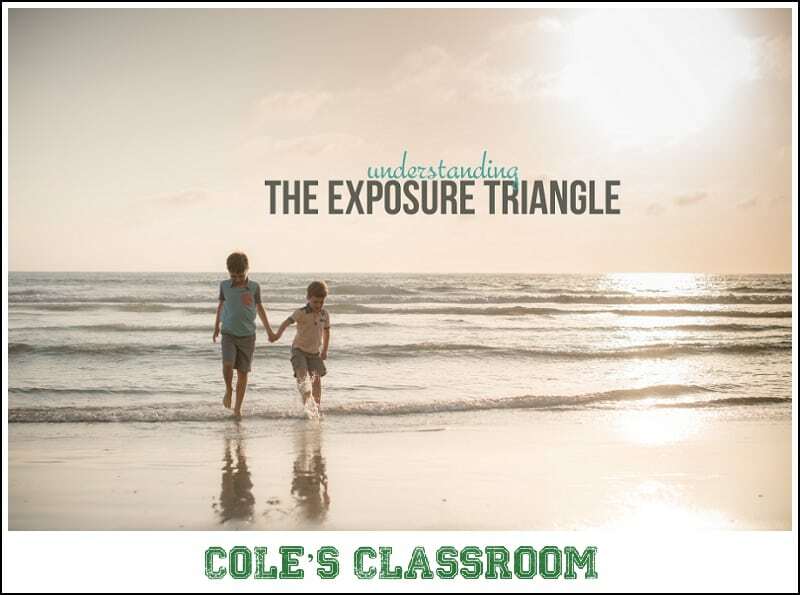 This will help improve your understanding of the exposure triangle! Please let me know in the comments if there is anything I can explain further, or doesn’t make sense! I’m here to help you! I’d love to hear from you! What exposure element do you struggle with the most? Understanding ISO, shutter speed or aperture? What mode do you prefer? Hit me with all your questions! Always a good read! And I won’t hold it against you going to Cannon! LOL Anyways, I find with the new advances of digital you can shoot at such a higher ISO without losing much. As an outdoor concert photographer it’s all about the ISO when the sun sets. From time to time I fight with shutter speeds though. The action happens so fast and no matter what, I’ll get a bit of blur from time to time. Sometimes it makes the shot though! I do have a question for you though. I have been seriously considering a fisheye for my next lens. I’m envisioning a shot from behind the drum risers of the band and the crowd. Set the focus to infinity and snap away. I’m sure I’d be able to get a lot of neat shots with the lens. The two I’m looking at are both Bower manual lenses for Nikon with Focus confirm chip. It’s a toss up between a 14mm f/2.8 and a 8mm f/3.5. I know with the 8mm I’d be able to get some wild shots but am worried about it not being a f/2.8 lens. Thoughts? Can I compensate the difference with a higher ISO or do I pay the extra $120 for the higher F Stop and loose some mm??? Hey Glenn! You know I LOVE concert work…I think that shot sounds awesome…I’d recommend you go with the lens that you think you’ll use more from a focal length perspective…the f-stop difference is pretty minimal, I’d crank the ISO and let er’ rip! I love this..about to read why u love a priority of m sometimes…. BUT.Here’s my thing. I still use A priority but i feel that sometimes w A priority my shutter speed slows down and I catch blurriness/movement… I was told for this its good to bump up iso, but then I get to much noise…. What’s your advice on this??? No mode will guarantee you of a “fast enough” shutter speed (unless you use shutter priority mode)… so the question, and answer to you is – what would you rather have, a blurry photo or a noisy photo? The answer should be: take the noisy photo because you can eliminate some of that but blurry photo is always trash. Cole…….I have been trying to perfect my concert photography. I have a Nikon 50mm lense that works well. As far as ISO, I have read that concert pics are best at 1600 or 3200. What is your take on the ISO settings on that? I have a couple of friends in bands so I get to practice again next week. I’m going to try many different settings & see what works. Wow, just thank you! i am constantly reading your articles and they are so helpful. Most that I read are either above my head or too beginner. I’m a little behind the times but I am still struggling with my transition to digital, and also with trying to shoot in something besides manual. I’m also trying to venture beyond landscape photography and this is the only place I can find great tips for everything. My biggest struggle right now is low light. Anything 800 ISO or above seems very grainy to me. Is this something that is fixable without a camera upgrade? I see all these beautiful pictures that are around 1600 and they don’t look it. Thanks! Lightroom Collections vs Smart Collections – Explained!